I can tell it’s November by watching the rain fall sideways. Today’s To-Do list included mulching my garlic bulbs with straw but I thought I’d get blown away, and who knows where the straw would end up? I brewed a coffee instead of braving the weather. 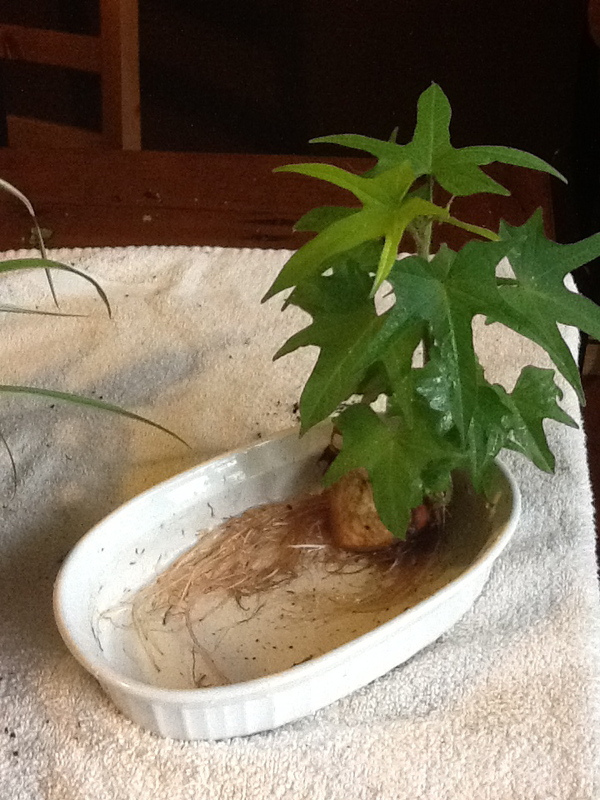 On the kitchen window sill, an organic sweet potato sat in a shallow dish. It’s been there for a month or so, soaking up water and sending out bright green leaves. The base of the shallow dish was covered in roots. The sweet potato was letting me know it’s ready for some soil. It’s November though! What am I going to do with a delicate sweet potato plant in the middle of winter? After a bit of contemplation, I came up with two options. Option 1: plant it indoors, see if it lives until the May and then plant it into the garden. Since I have a hard time killing healthy plants, I ventured out into the storm to gather supplies from the shed. With two large containers, half a bag of potting soil and wet slippers, I returned to the house. Each half of the sweet potato had numerous slips growing on it. 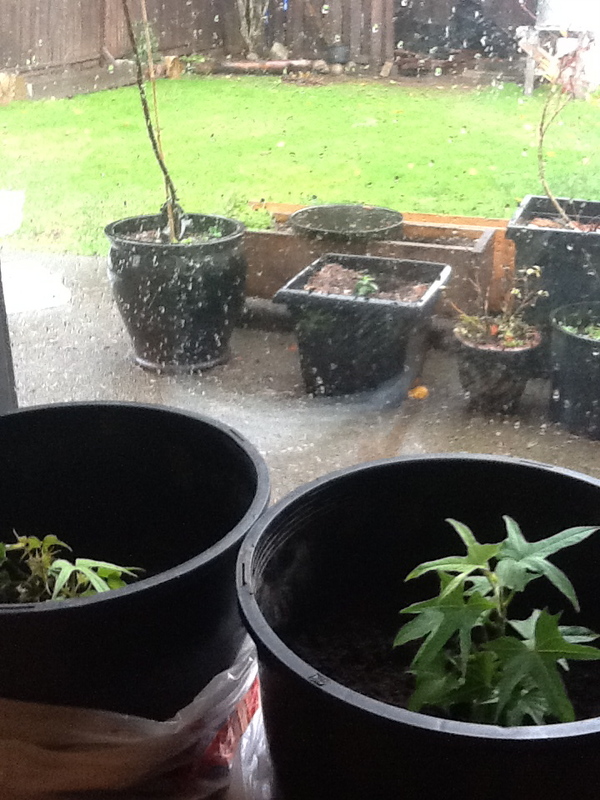 Normally, the slips are planted individually but I wasn’t about to go back outside for more containers. Each slip-filled sweet potato half is now planted. The containers are in front of my south-facing sliding glass door so they’ll receive plenty of light. I hope my experiement works. Fingers crossed. This entry was posted in Growing Food and tagged backyard, change, dig, food, fresh, front yard, garden, grow, lawn, organic, produce, soil, sweet potato, vegetable, yam by Lynda. Bookmark the permalink.